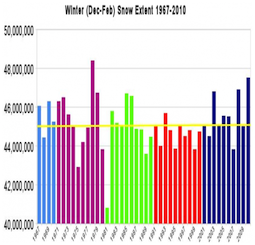 2001-2010 was the Snowiest Decade on Record | Wott's Up With That? “2001-2010 was the Snowiest Decade on Record“. Steven Goddard’s “guest posts” on Anthony Watt’s blog are getting embarrassing. He’s still going on about how much snow there is! He even accuses Al Gore of ineptitude. Now that’s rich… Steven, you’ve got issues. Big issues. Emotional issues as well as intellectual ones. Steven’s data comes from the Rutgers University Global Snow Lab. The closest he comes to explaining his climate change claims is this: A decade long record across the entire Northern Hemisphere is not appropriately described as a “snowstorm.” Actually, unless Steven can slap some legitimate statistical trends on this claim it’s just as likely a “snowstorm.” He once again has bupkis. Looks like Steven’s going to have the bupkis market locked down pretty tight. Steven's yellow line has no meaning, it's just a visual "trick" to create the illusion of an anomaly. Ignoring the regionality of his claim, his invented threshold of 45 million km² snow extend, and the lack of any evidence of statistical significance, how does any of this undermine the factual evidence of AGW? You know the answer. This entry was posted in It snowed!, Just Keep Saying It, Weather! by Ben. Bookmark the permalink.